Jukebox the Ghost is a Washington, D.C.-born, Philadelphia-based three-piece rock band. The band consists of Ben Thornewill (vocals & piano), Tommy Siegel (vocals & guitar) and Jesse Kristin (drums). 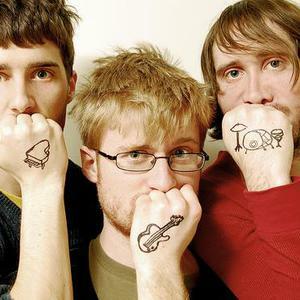 Since 2006, Jukebox the Ghost has toured extensively. In 2003, Ben, Tommy, and Jesse met while attending George Washington University. Shortly after, they formed a band called The Sunday Mail. After two years, the band decided to take a hiatus. During that time they ended up writing a lot of new material and wanted a new identity to coincide. They came up with the name "Jukebox the Ghost", after combining lyrics from a Captain Beefheart song and a line from the book Pnin by Vladimir Nabokov. In 2008, they released their first album "Let Live & Let Ghosts", and began playing new songs in concerts. Jukebox the Ghost recorded a cover of Ace of Base's "Beautiful Life" for Engine Room Recordings' compilation album Guilt by Association Vol. 2, which was released in November 2008. Following their tour with Ben Folds in early April 2009, they began their headlining tour in the UK with Nightmare of You. They began their headlining tour with Jenny Owen Youngs back in the United States on April 30 in Chicago, IL. This tour lasted into June, at which point they temporarily stopped touring to concentrate on their next album, "Everything Under the Sun." The band began recording for the new album on September 29th, 2009 at Tarquin Studios in Bridgeport, Connecticut. In February 2010, Jukebox the Ghost toured across Europe with Adam Green of The Moldy Peaches. This was followed by a separate tour in the United States with bands Tally Hall and Skybox. They will begin touring once again in late May 2010 with the band Free Energy, and will be playing at Lollapalooza in Chicago this August. "The Popular Thing," a song from their upcoming album, is featured in the movie Diary of a Wimpy Kid.